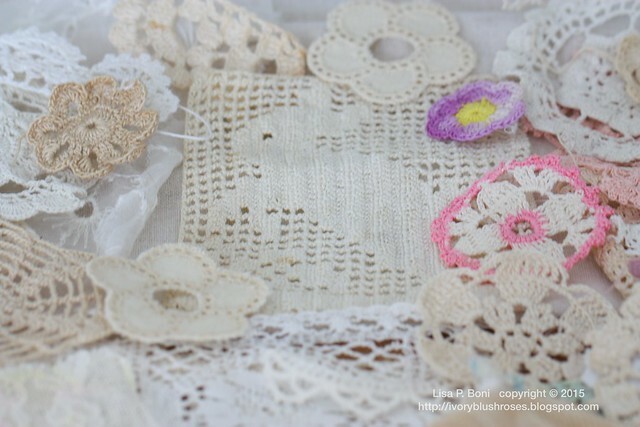 A good part of my Lace stash is stored on acid free mat board cards in nice storage shoeboxes, but I also have a large basket of miscellaneous lace that I have picked up here and there. 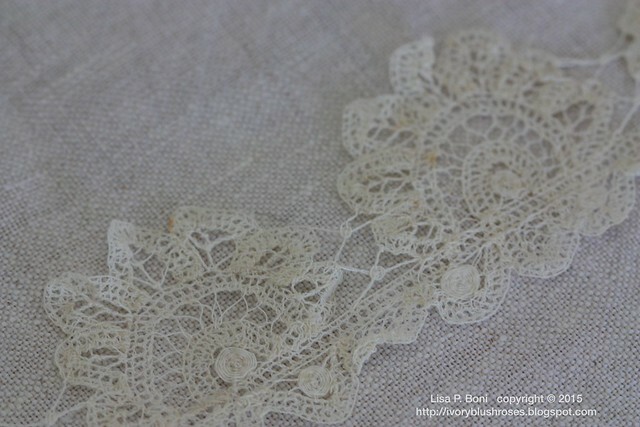 I watch for bags of inexpensive lace trims at the thrift and antique stores. While most of them have too much polyester lace in them, I bypass those and wait until I find a bag that contains mostly crocheted lace or other handmade type laces. Those are the ones I buy, usually for just a few dollars. I don't worry about small pieces or things that have been trimmed from something else as often, for crazy quilting, I just want a small bit anyway. When I get home, I just dump them into the basket. Then, as I'm creating blocks, I simply dig through until I find something that I think will work. My Mom's kitty, Kitzy Cat, has some neurologic issues and periodically has seizures. This past week, she had one that caused her to roll off the chair she was sitting on and into the lace basket. Whereupon, she also coughed up few dinner remnants and had some trouble controlling her bladder. She was fine (she had a nice soft landing after all! ), but the lace basket... well, suffice it to say that it needed help! I spent a good part of the weekend washing lace, pressing some of it, and getting things organized. 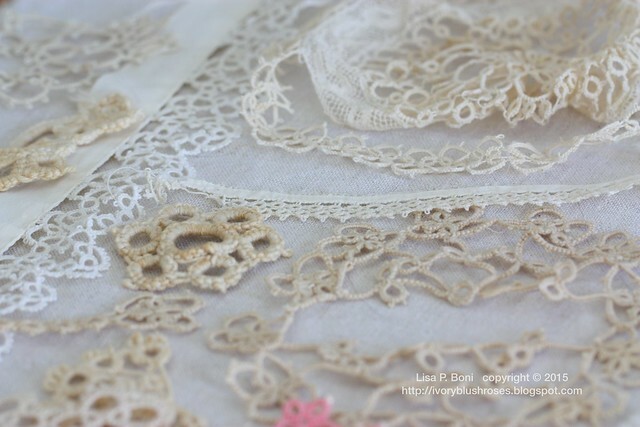 It turned out to be quite a lot of lace! And as I sorted and cleaned it all, I realized that I had no idea what was in that basket for the most part! 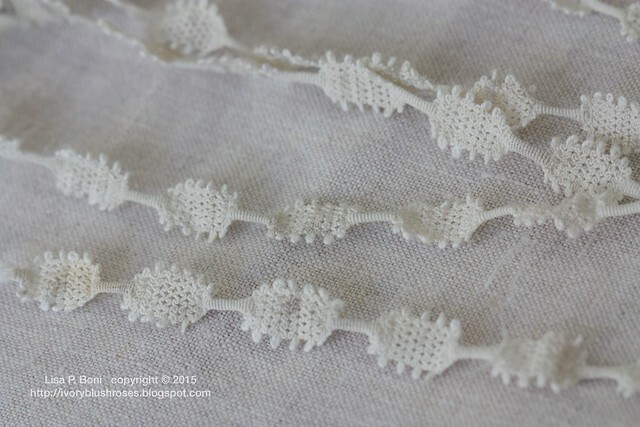 Though I got most of the lace organized and pressed, there is still a pile of narrow lace trims to finish up. 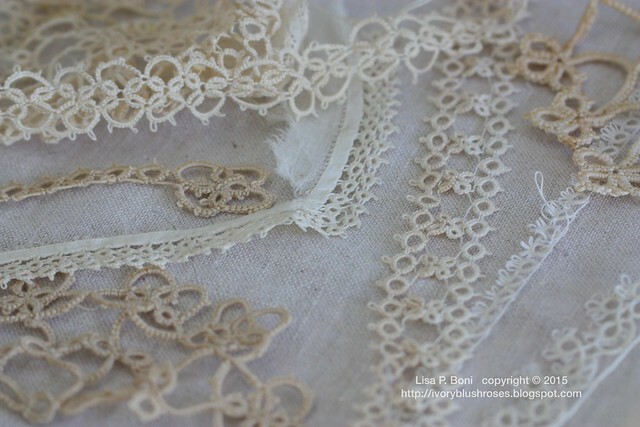 I hadn't realized just how many little lace medallions of all sorts that were in the basket! Nor had I realized how many hand-dyed lace pieces I had. Some are ones that I dyed, and others have been gifted to me or are ones that I purchased here and there. I rarely add colored lace to my CQ blocks, but I can see quite a few in here that I might use on some of my current projects! 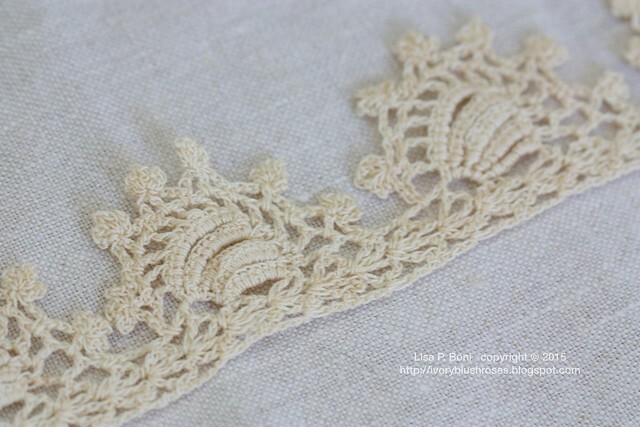 There was a nice bit of tatted lace, which is always among my favorite of all types of lace. 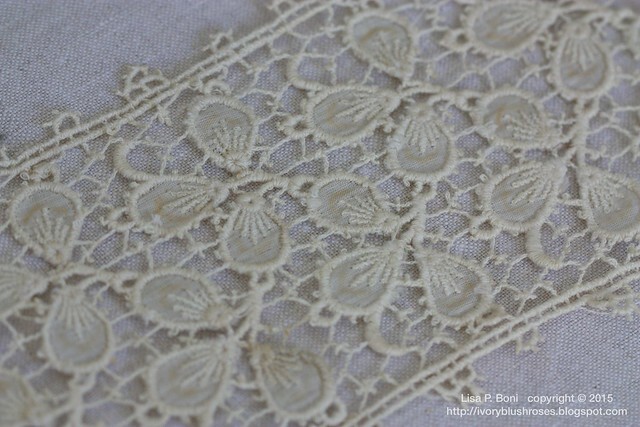 Maybe that's because my Aunt Lois made such beautiful tatted lace and because I learned to tat from her. I have a huge appreciation for how difficult it is to get every one of those tiny knots done perfectly! While my Aunt Lois was able to tat enormous intricate doilies, I have a hard time getting 6 inches of simple, usable trim! A few of the pieces of tatting are pretty big and chunky and stained with time, while others are exceptionally dainty and perfect. Among the crocheted lace was several pieces of this lovely Irish crochet. Just gorgeous! I used a bit of this on one of the Advent pincushions. There were lots of lovely machine made lace pieces as well! How about this delicate beauty? 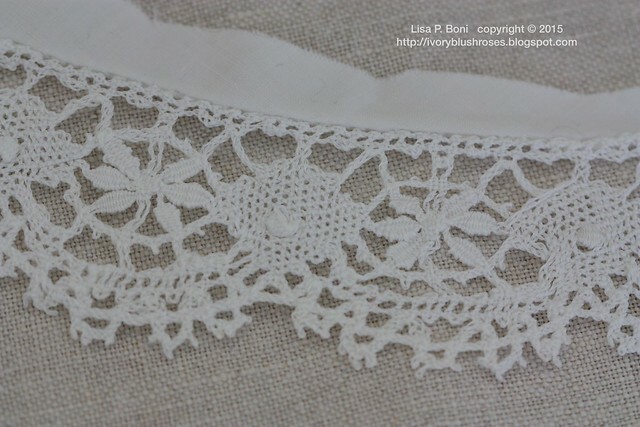 I believe this is probably a handmade lace that is maybe a combination of bobbin and needle-woven. There are two short pieces of this, one badly stained, and this one, in fairly decent shape. I love this beauty. Again, a combo of bobbin and needle woven lace. 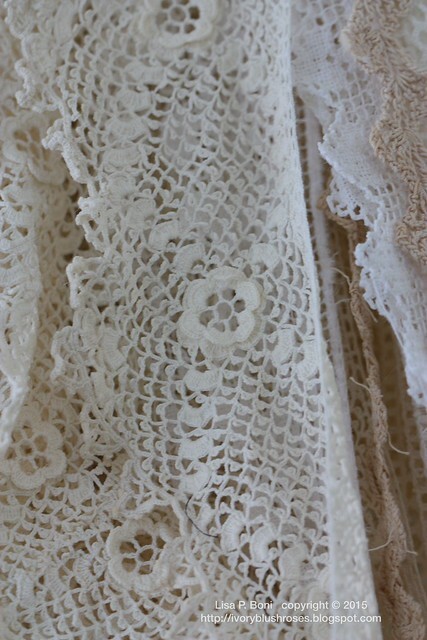 While the netting is machine made on this piece of lace, the embroidery appears to be all hand done. 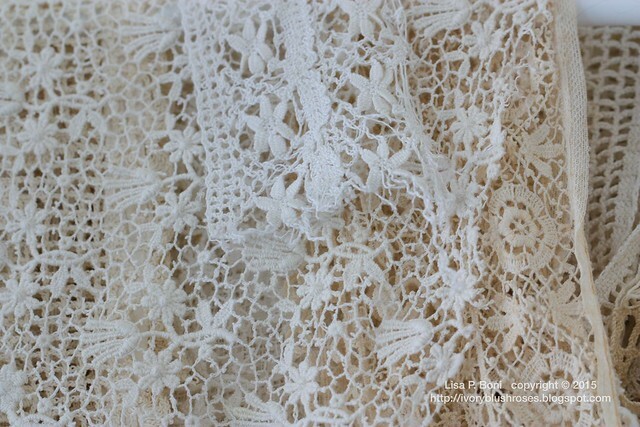 It's astonishing really, to think about the sheer quantity of handmade lace that is out there. 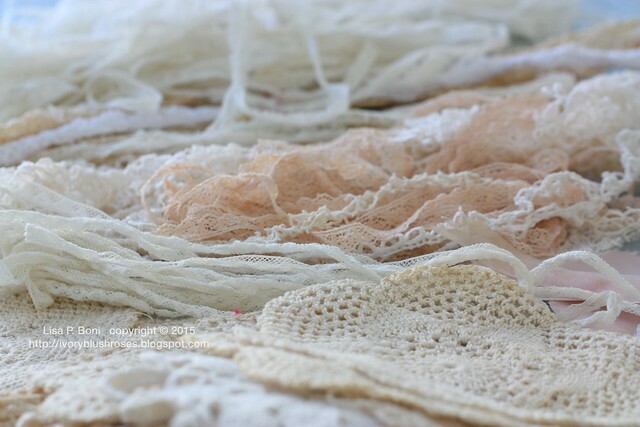 It boggles the mind to think about the number of hours that must have gone into creating yard after yard of lace. I love this crocheted one with its seashell like pattern. 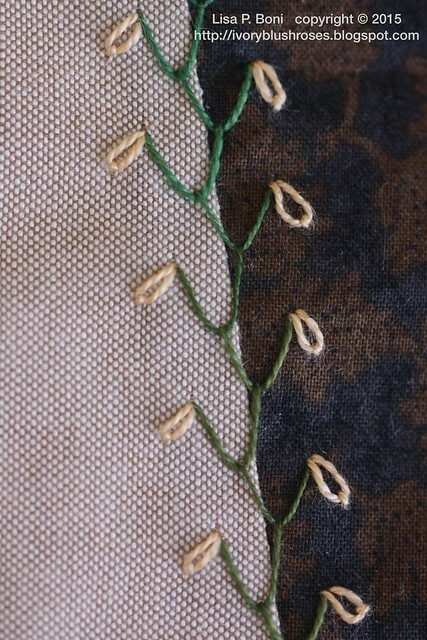 Then there is this piece of machine embroidered on organdy lace. based on the pattern of "stain" on each petal, I think that it must have had some painted on accent at one time. I love this old Victorian era trim. There are several pieces, some in better condition than others. 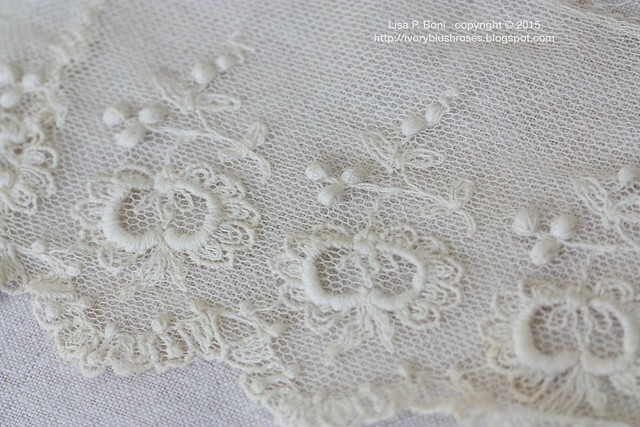 At one time, I had a doily that incorporated a similar trim . 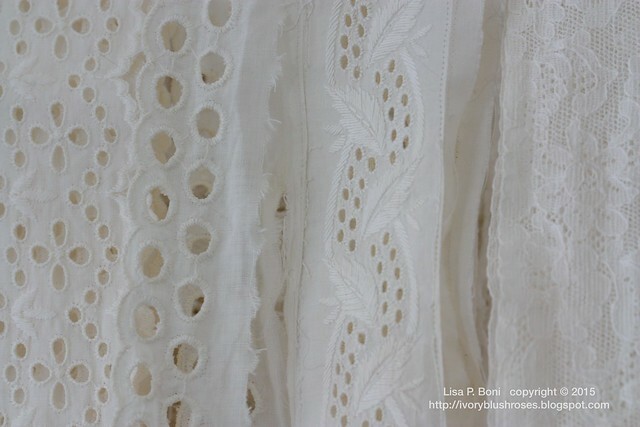 There are also several pieces of eyelet lace. Most of these are much older and the embroidery portions are SO much nicer than what you find on today's cotton/polyester eyelet trims. The one with the leaves appears to be all hand embroidered! At the bottom of the basket was a pile of black lace and some gold trims. most of this is fairly modern. I have a project that I need some black lace for and I had forgotten that I had this, so it will be great to use what I have instead of needing to buy new! I need to get some more acid free mat board to cut more cards to store some of these laces on. They deserve to be better treated than tangled together in a basket! 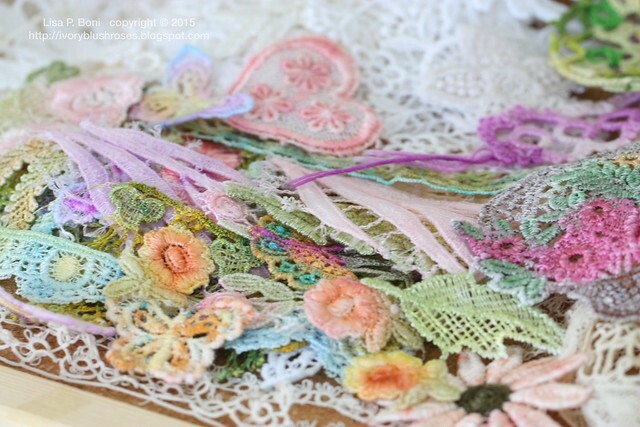 None of my Crazy Quilt projects this year have lace on them, but after going through all of these beauties, I realize that I need to work on a project to incorporate many of them in the future! 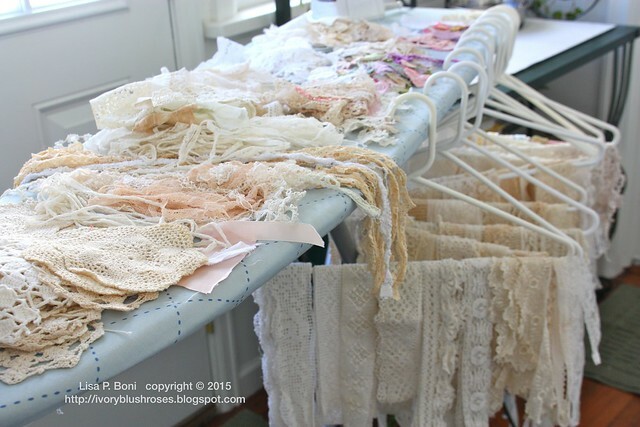 All this lace cleaning and organizing took place in the little laundry area between my kitchen and the garage, It's usually an area that I just pass through. 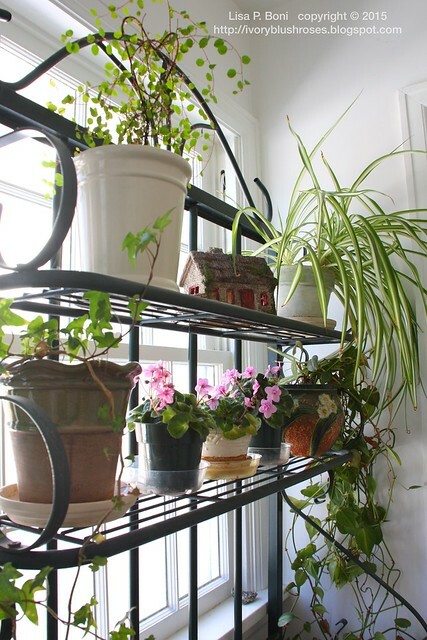 The cats get fed on this plant stand, but I rarely have time to just enjoy this lovely bright corner of my house. 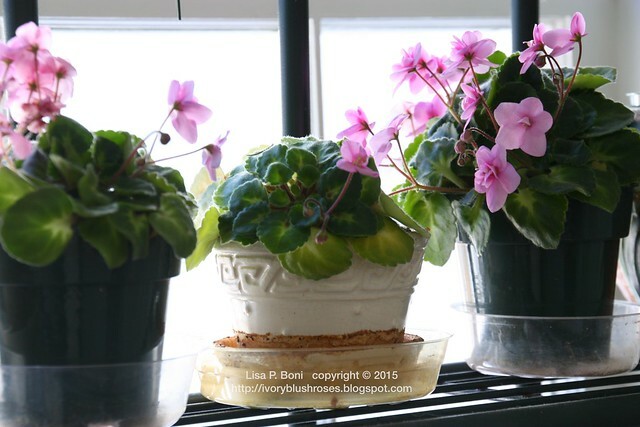 The little African Violets are blooming non-stop! I've had the violet in the center since shortly after our housefire in 1999. It has bloomed and grown considerably and the violets to either side are off-shoots that I've repotted. Looks like its time to divide them again! 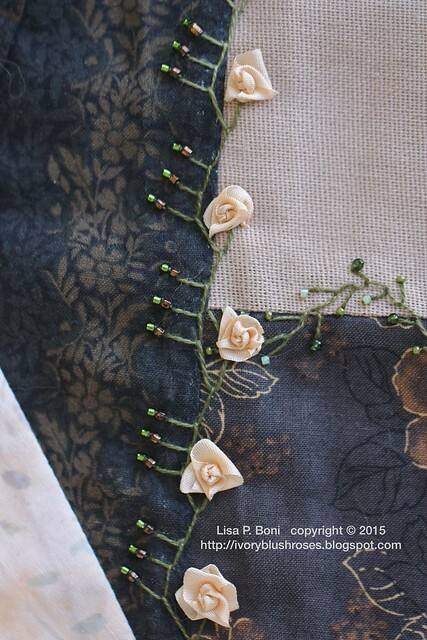 I've done a couple more seams on my Joyful Embellishment's project. I originally stitched seam #1 on Lonna's SteamPunk block, but decided I wanted to have it on this project as well. I liked how it looked with the lazy daisies drooping down, so I repeated that. Feather Stitch #11 is yet another variation that I have never tried before. I added some Fargo roses to it. I love how each one comes out differently, even though it seems like I do exactly the same thing each time I make one! I counted how many seams are left to embellish on this bell-pull/runner. There are 22, which is more than enough to finish out the month of feather stitches that Valerie is doing! I'll wait to see what February's stitches are before deciding if I want to continue using this piece for those. If not, then I'll probably continue with some feather stitch variations of my own. Lovely to see your collection of lace and I guess it could be said that kitty's accident might have been fortuitous. 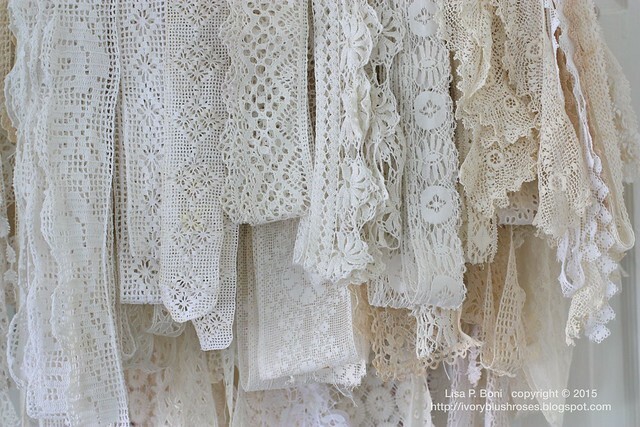 Wow, that is a lot of lace! I don't even think my stash holds up to that. LOL! Oh my gosh, what a wonderful collection of beautiful laces. Sua coleção de rendas é fantástica! Estou encantada! eu amo estas artes antigas! Aproveito a oportunidade e desejo a você um 2015 cheio de saúde e realizações! His collection of rents is fantastic! I am delighted! I love these ancient arts! I take this opportunity and wish you a 2015 full of health and achievements! Oh I am suffering from such envy! That was/is one heck of a basket of lace!!!!! Whatever you do with it will have no choice but to be beautiful.